Study Tip Motor Systems 1. Motor pathways have to do with the execution of behavior. They are more diverse than sensory pathways and are fine-tuned by other neural systems. Opposed to the sensory pathways finding comparable key elements to compare the anatomy is not feasible. In contrast with sensory pathways they do not have a 3 neuron ‘design’. The most direct motor pathways are the ‘Direct Somatic Motor pathways’. The corticospinal tracts for execution of behavior in the body. And the corticobulbar tracts for execution of behavior in the face. 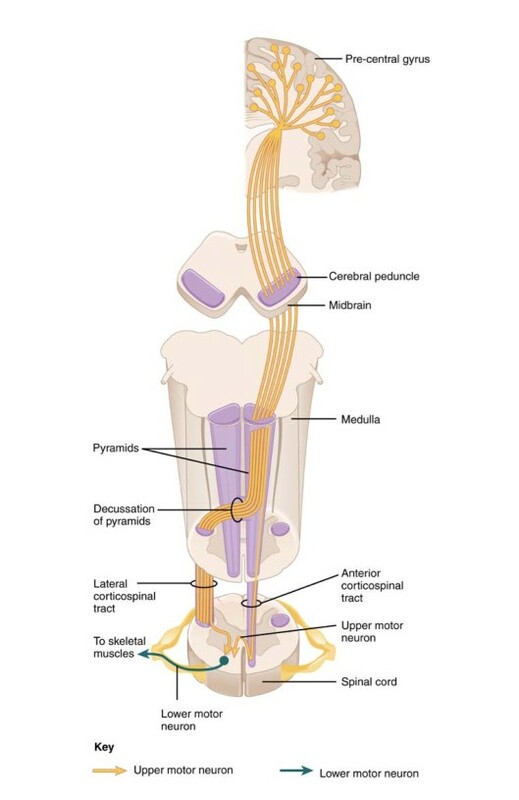 Other motor pathways are the indirect pathways, the brainstem–to-spinal cord pathways. First of all you can have a look at the direct and indirect motor systems in this animation: The extrapyramidal and pyramidal motor systems . Study Tip Motor Systems 2. Also you can use the resources on page Virtual Lab, Unit 3: Motor Systems to enrich your understanding of the core concepts of motor systems. Study Tip Motor Systems 3. Basal ganglia are very important in motor pathway. In Tutorial Circuitry of the Basal Ganglia, part 2 at 8.28 to 11.02 the basal ganglia in the brainstem model are pointed out. This video material of the brainstem is good material to get a grip on the spatial orientation of the basal ganglia. In addition to this valuable course material it is very good to use this site of the basal ganglia, by the University of British Columbia. for your study. This animation: 2-Minute Neuroscience: Basal Ganglia by Neuroscientifically Challenged, further allows you to review the anatomy of the basal ganglia and ties it to the motor functions of the basal ganglia. Study Tip Motor Systems 4. In addition to your study of the course material you can study reflexes by having a good look at the relevant animations of the textbook: Stretch reflex animation and The flexion reflex. Study Tip Motor Systems 5. Finally the “Handwritten Tutorials” on YouTube are very useful in your study. The ones in bold are especially relevant to this unit. Study Tip Motor System 6. Most relevant figures from the second edition of the course textbook for sensory and motor systems are below. You can copy the name of the figure and paste it in ‘Search in this book’. Then a list of relevant pages will appear. Click ‘Show details’ of the most relevant page and a link to the most relevant page appears, click that and scroll down to locate the figure. You can only use these images for your own study, images can’t be shared. Copyright:. D. Purves et al. 2001, Sinauer Associates, Inc. For more information, see the Bookshelf Copyright Notice. Study Tips Motor System 7. It is a very good idea to use the material on the page Learning Materials for reviewing pathways.